Here's the best and brightest for your weekend in and around D.C.: learn about the coffee or whisky you drink; connect with Japanese culture for Cherry Blossom season or participate in the massive March for Our Lives demonstration and so much more. Local Arlington, Loudoun and Prince William County restaurants will offer specials and deals all weekend for Northern Virginia Restaurant Week. Among the dozens of participating restaurants are Balkan favorite Ambar —offering unlimited small plates for $35 — and pizza and grill joint Matchbox has $20 lunch specials and $35 three-course dinners. Relax at ArtSpace Herndon with tea and games. You can bring your own or play one of theirs. Sip beers and enjoy a melange of performances at Brew Republic. You love coffee. You drink coffee. Maybe you even crave coffee. But do you know it? Counter Culture's new training center aims to teach baristas and the public about brews. The Adam's Morgan training center is opening on Friday and an open house with free espresso is scheduled for Saturday. One Eight Distilling's "Intro to Spirit Sensory Evaluation"
Open your five senses and really appreciate your drink. Tickets are $48.70. If goat yoga just isn't enough, head out to Lovettsville to bottle feed and hold baby goats. If you're having a bad day, this will probably fix it. Timed tickets are $10 and tend to sell out. The annual Environmental Film Festival in the Nation's Capital is closing out this weekend and there's so many movies left to see. You can find a full schedule here and check this Facebook page for free screening codes. Remember PostSecret, the website where anyone can mail in a postcard divulging their hidden truth? The blog is coming to life at the Lincoln Theatre. Tickets are $35. You don't need to be Miranda Priestly to know that a shirt is never just a shirt. Join Rebecca Durgin, who has a Master of Arts in History of Decorative Arts, as she discusses the history of women's fashion. Tickets are $8 and the event is hosted by Washington DC History & Culture. Dead Meadow, The Strypes, Maluma, Demo Lavato are in town this weekend, and there's also a March for Our Lives benefit concert. Up to half a million people are expected to attend this school safety and anti-gun violence demonstration downtown. Here's everything you need to know. Fall-Out Boy, G-Eazy, Bebe Rexha, Lizzo and other artists are performing at the show, which is affiliated with March for Our Lives. Tickets start at $100, but half-price tickets are available for students with an ID. Anthem is giving out free tickets to students in town for the protest through the organizers. Local officials and students will meet up before the larger march to discuss gun violence and how it impacts D.C. The group will then walk to the national protest at 10 a.m. The indicator tree is in full blossom mode, just in time for some of the festival's best activities. Celebrate Japanese culture with Taiko drumming, music, dance, face painting and crafts at this family-friendly event. Friday, Saturday and Sunday at 10:30 a.m. at Landmark Theatres in Bethesda and D.C. locations at Penn Quarter and West End. Three Landmark Theatres are celebrating Japanese animation house Studio Ghibli with morning viewings. This weekend, West End Cinema is showing "The Wind Rises," Bethesda Row hosts "Kiki's Delivery Service" and E Street Cinema screens "Nausicca of the Valley of the Wind." Saturday showings are dubbed in English and Sunday showings are in Japanese with English subtitles. Dive deeper into the history and lore of the cherry blossoms with a free talk from a National Park ranger. Boutique Cherry Blossom Creative will host a pop-up shop and Spring Cleaning Sale this weekend, where you can nab cute, local products for a good price. Lay back and relax for a guided meditation in honor of the Cherry Blossoms. Tickets are $12 before fees. Need more ideas? 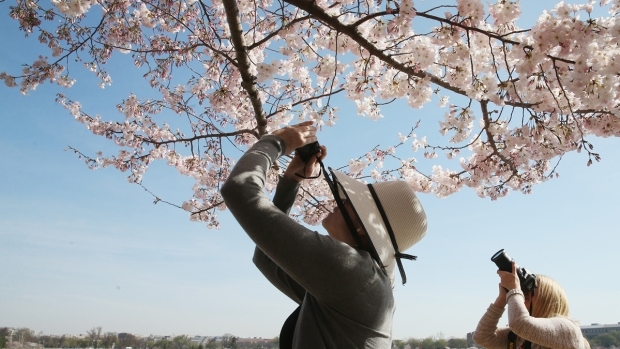 Here's our guide to the Cherry Blossom festival.